A Junk-Foodaholic's Journey to a Healthy Lifestyle: Can This Weight Gadget Work For You? According to an article I read recently, there's a time-tested gadget that might help keep the pounds from sneaking back on your body. Research shows that people who weigh themselves regularly after reaching a goal weight do much better keeping the lost pounds off. I believe it. That's one thing I wish I had done when I was at my goal weight. I wouldn't be in the shape I'm in today. And it's the main thing I plan on doing once I reach my goal weight again. When you’re trying to lose weight, a bathroom scale may not be your best friend. It doesn’t always tell the whole story. But if you’re trying to keep lost weight off, a scale could be just the thing to keep you from backsliding. Researchers asked people who had lost weight over a 2-year period to weigh themselves daily for 18 months. The result? People who regularly weighed in were more successful at keeping the weight off for the long haul. Labels: Can This Weight Gadget Work For You? Very useful information on something that seems obvious, but is too often overlooked. I got in the habit of weighing myself every day, at the same time, when I was losing my 40 pounds, and it really helps. Hi Mike! You're right - it's an excellent tool. Thank you for the article; I followed through with the related articles which added to the information. 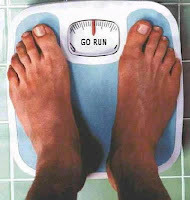 I agree, a scale is a good friend...really lets you know when things starty creeping up. Hi Mommy and Me Boutique! It's not so much of a friend now tough! :) I know it will be as soon as I lose this weight though. Thanks for commenting!